From this month's haul that was shipped from Japan was this very cute Hello Kitty gift box of adorable snacks. 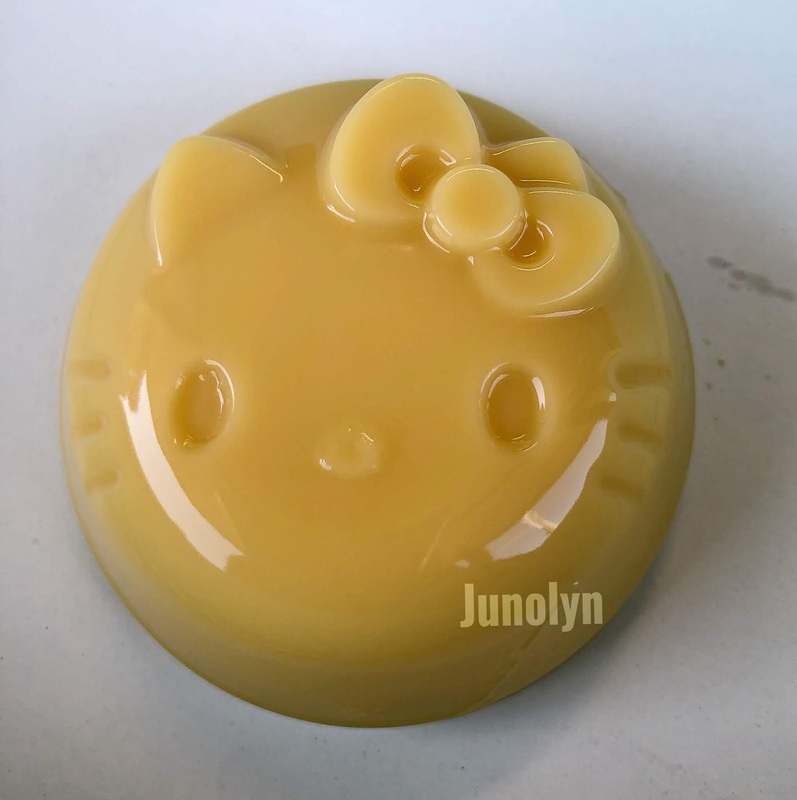 As a Collector, I just had to share my first ever Hello Kitty pudding AND bread food. 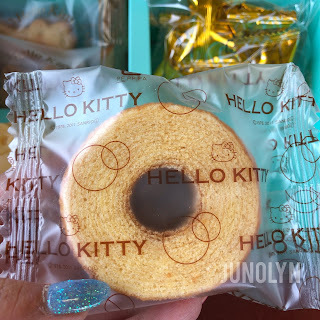 Even with the Hello Kitty Cafe just being an hour away from Los Angeles, there is a limited source of kittified food. 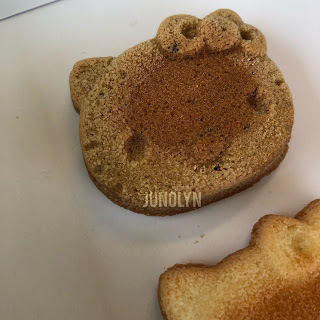 Some of their pastries and desserts do not have that quality art food design that we see daily on Instagram. So for the Collectors searching for the best of the best, we find alternatives. 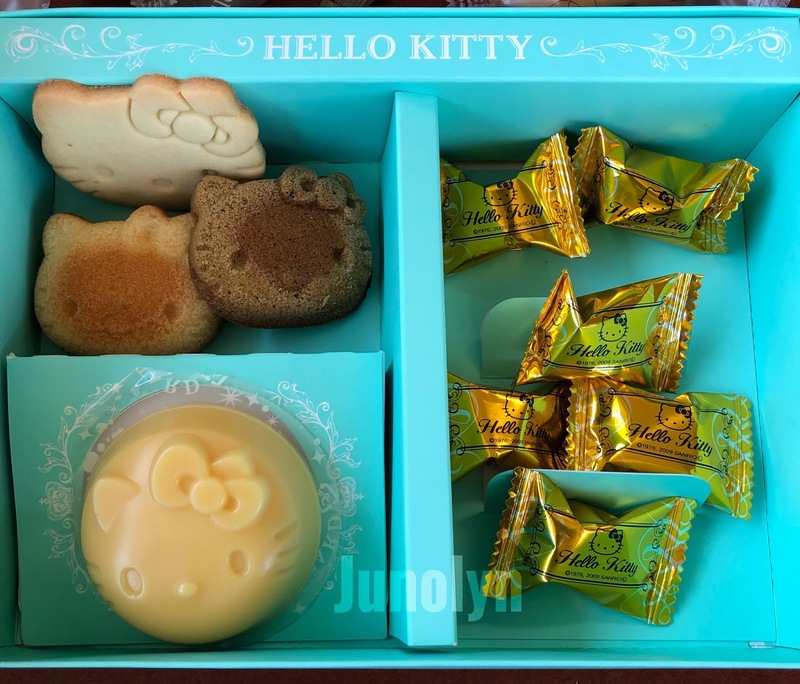 For the first time, Sanrio Japan online has sold a gift box shaped with Hello Kitty sweets. 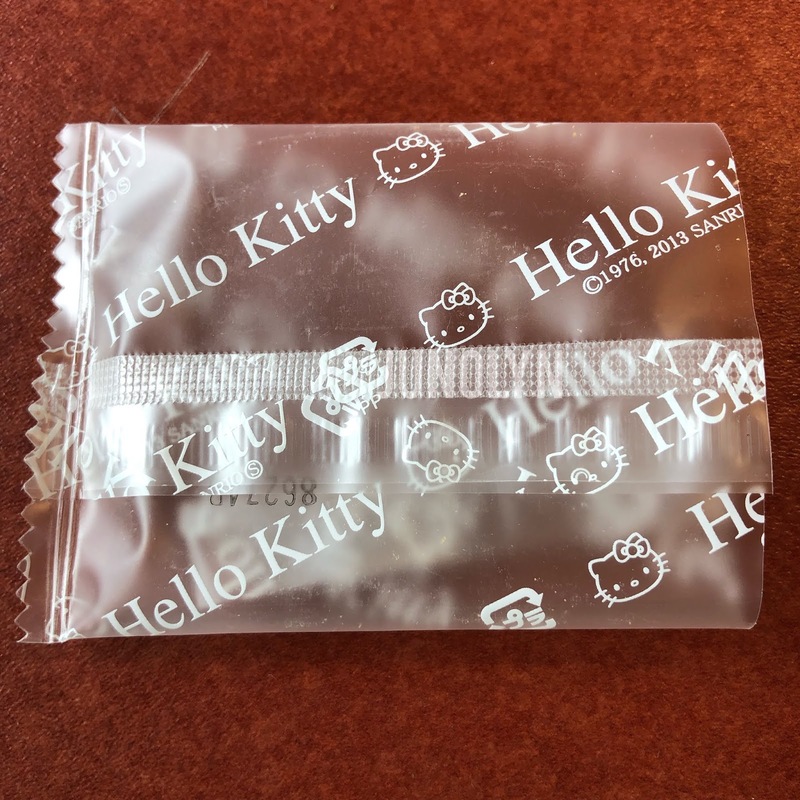 Sure, not every item has a Hello Kitty art design, but it's more quality art than I have ever seen provided. When I first lifted the cover top, I was in awe because it was a surreal experience. I was very excited to try everything. 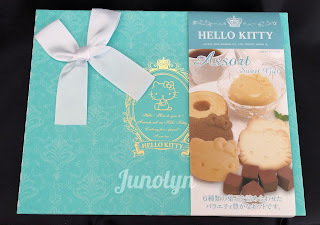 I loved all the cute packaging, but I knew most of it will end up in the trash and the wrapped chocolates will be gifted to other Collectors. 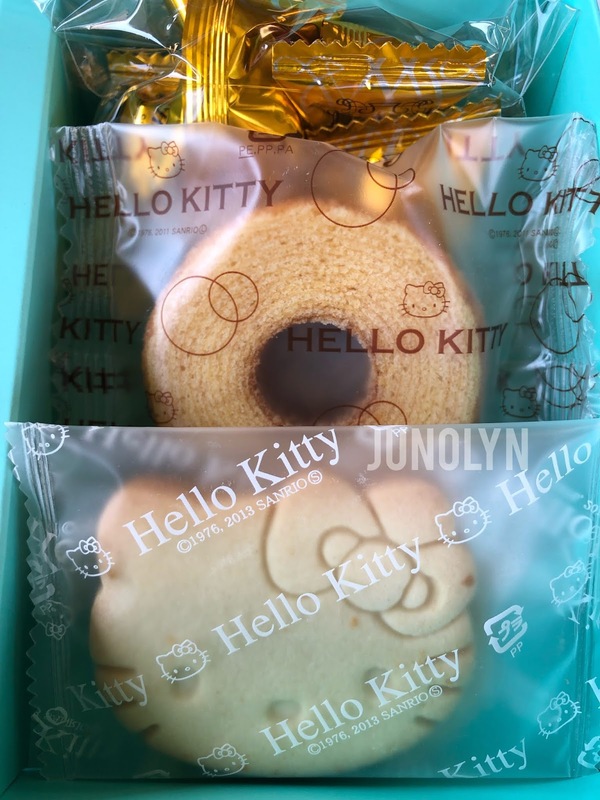 It's what we do when we find cute kittified food -- we share! Logan tried the dark bread snack and I tried the lighter version. It had a bare hint of a sweet taste to the snack, but I don't think it was a cake at all. It was nice and great for documenting on most of my social media accounts. The whole cost of the gift box was so worth every penny. All these photos documented will last a lifetime because I can look back and remember the experience of finding Hello Kitty food. 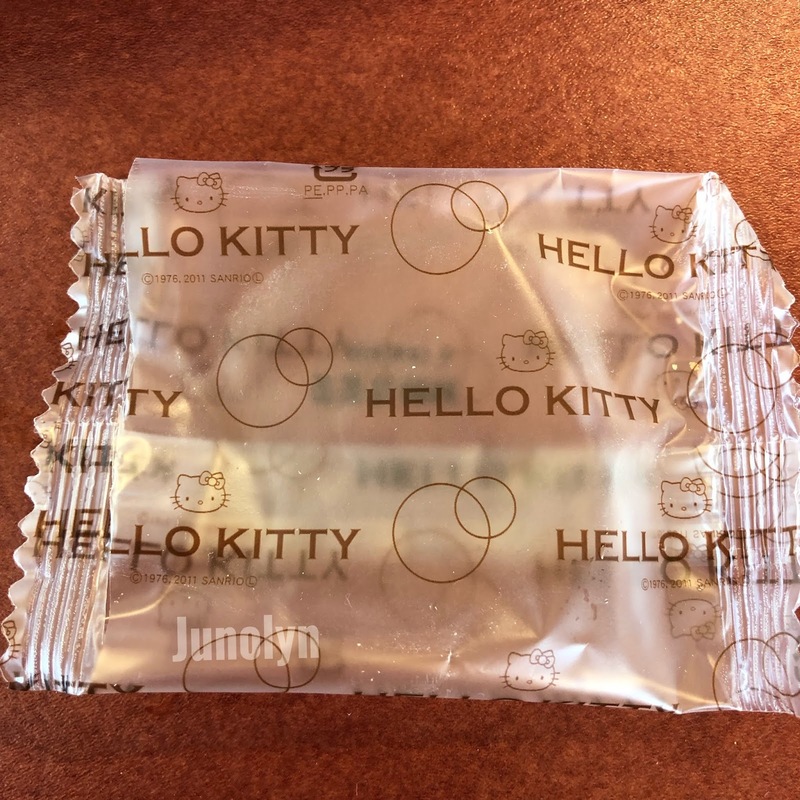 These two wrappers will be my first to be placed in my future Scrapbooking plans. Yes, it's me being a toal fan girl here celebrating my love for the character in a big hoarding way. Shh! I don't think I'm the only one going overboard with our obsessions. It may tone down for me if I can find more quality Sanriofied art food on a regular basis than these days of scarcity. 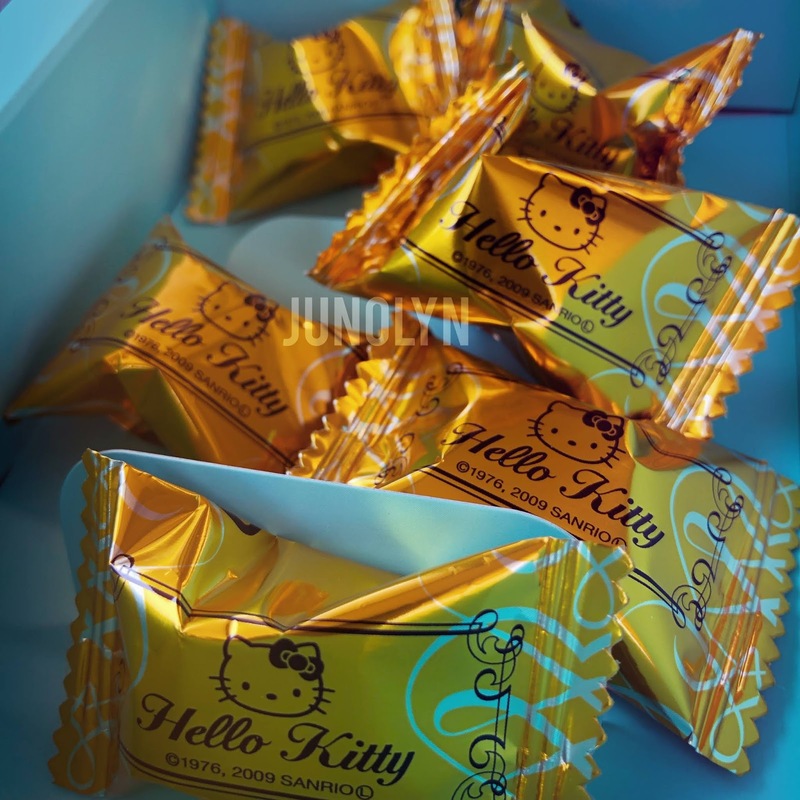 The chocolate wrappings are too cute for words, but the sweets inside the packaging is just a normal piece of chocolate. 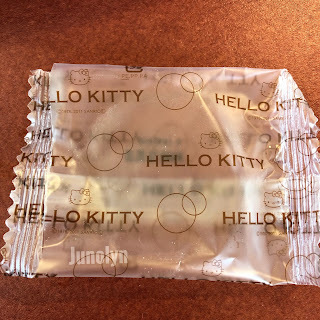 On the first bite of the chocolate, you taste some bitterness to it and then, you get to the sweet filling inside. Chocolates are definitely addicting and better shared! And, I saved the best for last! The Hello Kitty pudding was the best dessert out of the whole gift box. It was amazing and well documented for sure before I destroyed it. I was in awe with it's shape of the ears and bow. The character mold was nicely done. The whiskers, the eyes, the nose, the shape, the color -- all were closely examined with fascination!! Another amazing moment documented in my journey as a Sanrio Collector and it won't be the last. 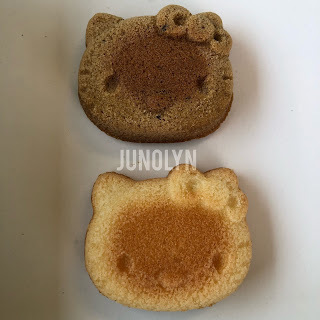 Happy Sanrio Hunting! Over the years, I have accumulated so much Sanrio stuff that I'm amazed at the size of it. About 10% of it are doubles and may end up on eBay or eCrater. If I ever decide to part with something special, I will only offer to my Instagram followers first before going public to find a buyer. My private Instagram account is open to only serious Collectors as they have an official 100% ACTIVE standing in the fandom and are more trustworthy than strangers. I used to have my main IG account public, but decided to switch to private. I'm trying to protect myself from strangers trying to access my personal information. You can't be too careful these days. It's been such a long time that I have parted with some of my collection or have gone through the entire collection to see if I'll ever downsize. That day for me is not near, but I thought about ways that might help a fellow Collector decide what to keep and part with his or her stuff. We all go through this where we eventually run out of space or going to happen to us along the way in our journey of collecting. In the beginning stages of collecting, we want what we see others that have a giant collection to proudly display and contribute to the crazy fandom with knowledge and expertise. While that may be good in the beginning, but I notice that many people collect just to gain a collection in a short amount of time and then, it's show-and-tell. They get their 5 minute fame in the fandom, but then they slowly fade into the background. Either they slowed down their collection or that they have lost interest in Sanrio while other interests in their life take precedent. If you have gone to collecting with a genuine heart, your collection will grow and grow until you have amassed too much stuff. I have done this with my collection. I have collected all things because it was what other Collectors were doing as well. Many items equals to an impressive amount of display because there are many who will admire you and want to aspire to have a similar collection like yours. I'm here to tell you: STOP. Before you continue your journey, you need to re-evaluate your reasons for collecting on a daily basis because as you age, things become less important to you than say, 15 years ago. It's how people outgrow their collection and sell it all off. I'm here to remind you for your love for Sanrio and how you can downsize without losing interest of it all. WHY ARE YOU COLLECTING SANRIO? Personally, for me-- I am collecting because I have been in love with the characters since I was a child. I have never outgrown it because I really love to surround myself with cute and cool characters. Some might say I live in fairy tale fantasy and it's probably true. There are times that I want a few of Sanrio's characters to be real. These characters bring purpose to my dull life where I can let my imagination run wild. The many, many possibilities and different styles to choose from day to day. WHAT IS YOUR GOAL IN YOUR COLLECTION? My goal is to collect only special collectibles that I am currently in love with at the moment. For an example, I have an intense worship for all things Robots with Sanrio characters. My goal is to collect things that I deem as special in my heart and coincide with my interests. For an example, I may love Hello Kitty but I don't feel the need to collect everything like the Dodgers' HK bobbleheads. I don't like sports so there is no interest there to acquire one. Things like that keep me grounded and keep my collection manageable than it owning me. DO YOU ENJOY YOUR COLLECTION OR DOES IT OWN YOU? One thing that I seem to enjoy is just gaining a collection of cute Sanrio pens and pencils because I have many choices to choose from on a day to day basis. I will never run out of cute things to use in my drawing or if my mood wants to do is just write. I have the tool to do whatever my interests lie. I am surrounded with beautiful stuff. 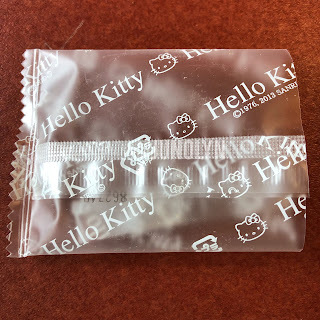 These days if I walk into a Sanrio store, I am 99% walking out without a pen or pencil purchase because I don't like the design and quality to it. Now, with vintage pens -- I have a variety that I can spend all day squealing with love because I still cannot believe that I get to own it. I can't describe how much I enjoy just to be able to say I have something from the early 90's and I'm one of 3000 people or more who has something like I do. There is another aspect to collecting where I collect Sanrio clothes, shoes, fashionable accessories where I will combine everything and dress up all kittified or whichever character that I am feeling that day. It's an awesome feeling that I now have choices to choose from than years ago where there was none to acquire for adults. I can kittify my car and home. Everything in my life is geared to my love for those Sanrio characters. It's a lifestyle for me. From answering all three questions, are you collecting with a genuine heart? Are you truly honest with yourself or do you want to compete with others? 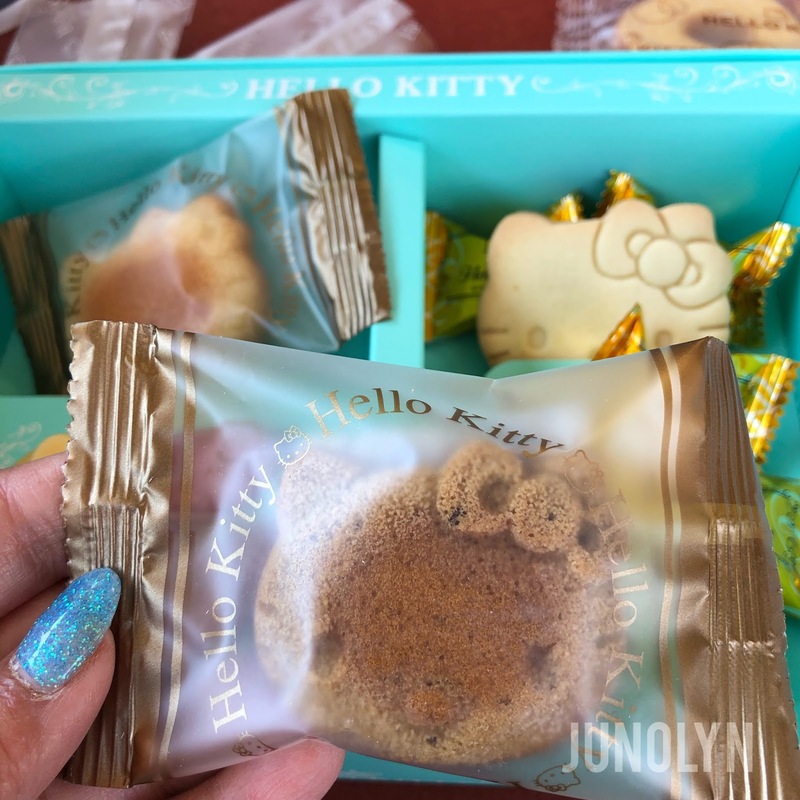 If you only care about bragging and competing with others, then collecting Sanrio will not last as your interests will lead you to the next exciting thing. If you're not here for the 5 to 10 minute fame, then let's continue with downsizing as best as we can do. Since we can't display everything because of space, we need to think ahead of all the new additions that will be gained over the next several years. You will need to have space for them. You will need to specify what you are only collecting and if you will build only a Shrine room or are you into only collecting stuff that you will only use in life? Or perhaps, is it both? A Shrine room and a Sanrio lifestyle? How far are you willing to take your obsession? I'm already there with Sanrio. I eat and breathe Sanrio. There are people who are just Enthusiasts and are not willing to take it that far. Choose the outcome that you want for your collection. Are you only into fashion and that's it? Simple. Your closet is your storage and you are the walking Sanriofied model on display for your love to the character. Choose which types of stuff that you want to collect and stick to that group or style. Do not collect just because the item is rare and you see dollar signs in the future. If your mindset is towards money, then let me give you a reality check here. 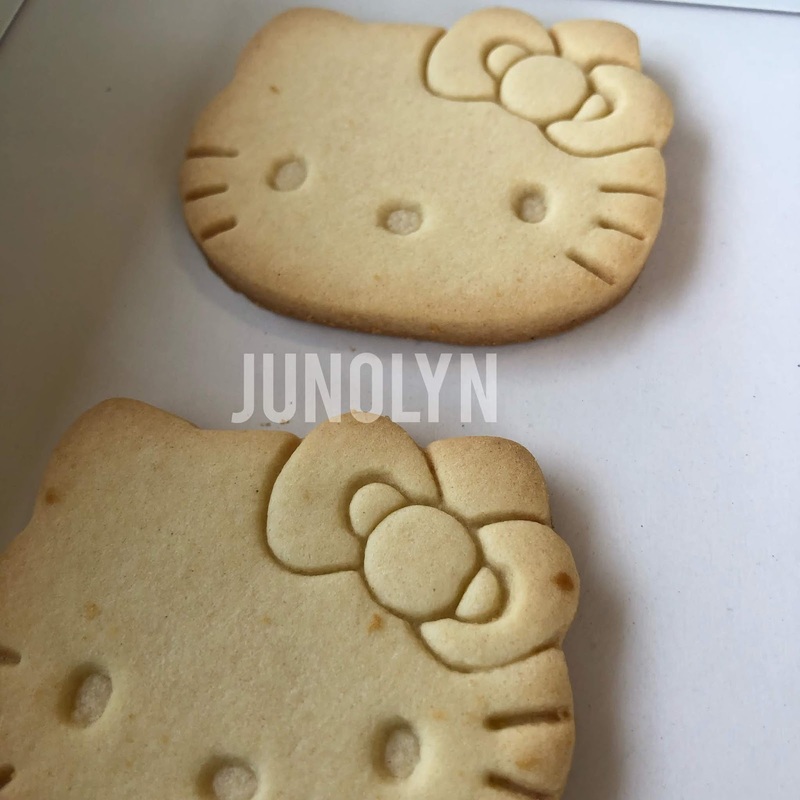 Hello Kitty is not a good investment because not everything related to Sanrio will guarantee big bucks like Barbie or Comics. We are a small fandom compared to millions like Disney Collectors all over the world. Or even Lego Collectors out there. You will run into a small amount of potential buyers who will pay top dollar for MINT Collectibles. 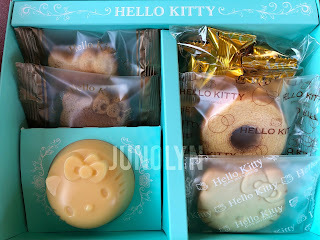 It's not a guarantee because a lot of Sanrio Collectors come and go all the time. Again, it's a small portion compared to the whole wide world. Downsizing only works if you don't hang onto a Collectible that is just useless to you because you want to try to sell it down the road. If the reason that you're keeping something is superficial, then let that be a reason to give it away or sell it off. If you are ever unsure if you want to keep something, you can always store it away for a few years and return back to it when you are ready. Ask yourself this: when you saw it again, did you miss it or you didn't mind that it was gone from your display of collection? Your answers will tell you that if it's any use to you. You don't want items to be piled behind many more stuff hidden away, just to collect dust. You want items that you can rotate here or there in your Shrine room to work on a project or to use for photo-op displays. Is it a style that keeps you in love with the item? Specify what should only be in your collection. Categorize in groups and take away any that are miscellaneous and not part of the Collection. What is your lease favorite thing in your Collection. Can you part with it? What do you love more? Why? What is your intention in collecting it? Focus on a certain style or interest in your collection to settle which items need to go. Your items will be much appreciated in someone else's display of collection, rather than being a dead weight on your shelf. Remember your goal: you want to have space available when you're planning ahead to hoard new additions to your Collection for the next couple years. You decide if it will be a great score or an impulsive buy. You can worry about this later when you do your next downsizing project down the road. It's baby steps is what matters when you have to let things go. Just know yourself and what you don't really need or want. 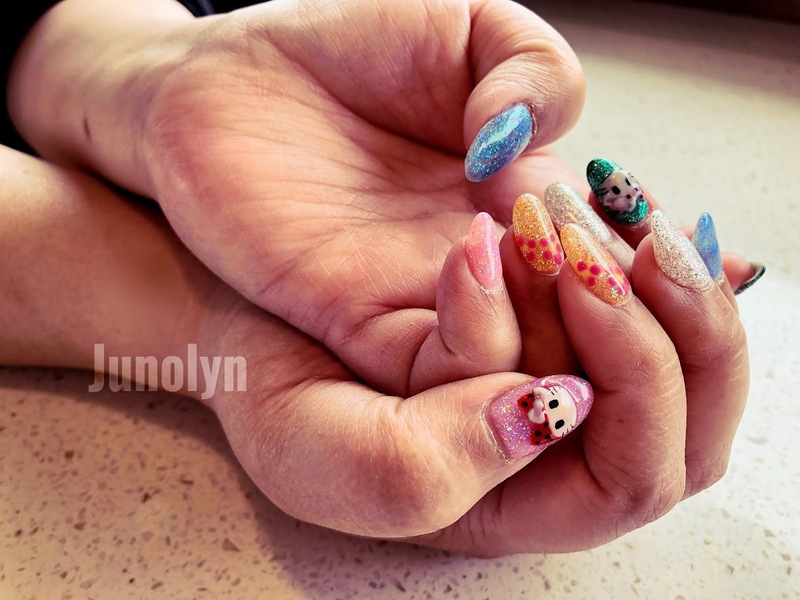 At first, I wasn't going to blog about my new nails that I had gotten done for Easter, but eventually, I decided that I was too nitpicky about it. 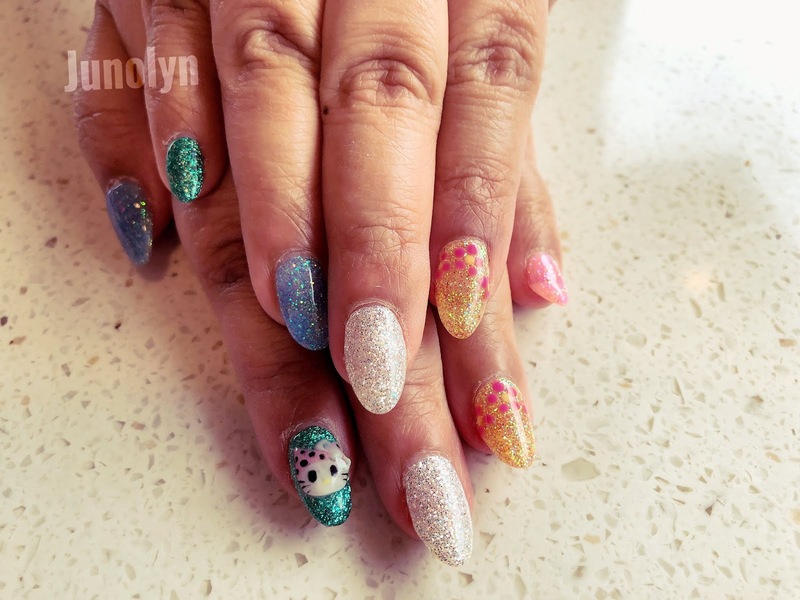 Below are Easter theme colored nails of light blue, green, yellow, and pink. An added touch is white. All colors are glittered to make it shine a bit more. More plain and less expensive than my previous Hello Kitty nails. Overall result, I'm a bit unhappy with it, but then again -- it's an experiment style that I am trying for Easter. For next year, I have already found my next Easter inspiration to do and I'm excited to once again try another style. While my nail pattern is somewhat a ray of whimsy colors, it isn't too bad when light hits it and my fingers shine all over the place. 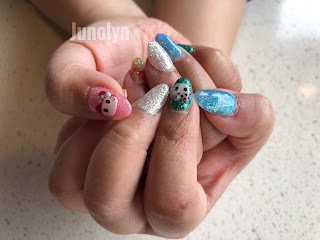 I'm just not in love with the nail art of Hello Kitty. The nail technician didn't make the nose yellow enough because it looks like the character has no nose. Unfortunate, but an experiment fail. At the end, she didn't even ask me if everything was all right -- meaning if I was okay with my nail art. Always at the end of the session, all nail technicians have checked with me if there was any problem. At the end, I decided to choose a favorite technician and stick with that person when coming to get my nails done. I was aiming for a different nail style than just all glitter nails. It's similar to the glitter style, but more of a textured tone to it. Another thing is that the nail technician didn't want to mix colors to create a lighter Easter effect. The only option similar to the style that I wanted had to use glitter. I guess if you're designing nails for your career, wouldn't you expect that they can create really cute 3D nail art characters? 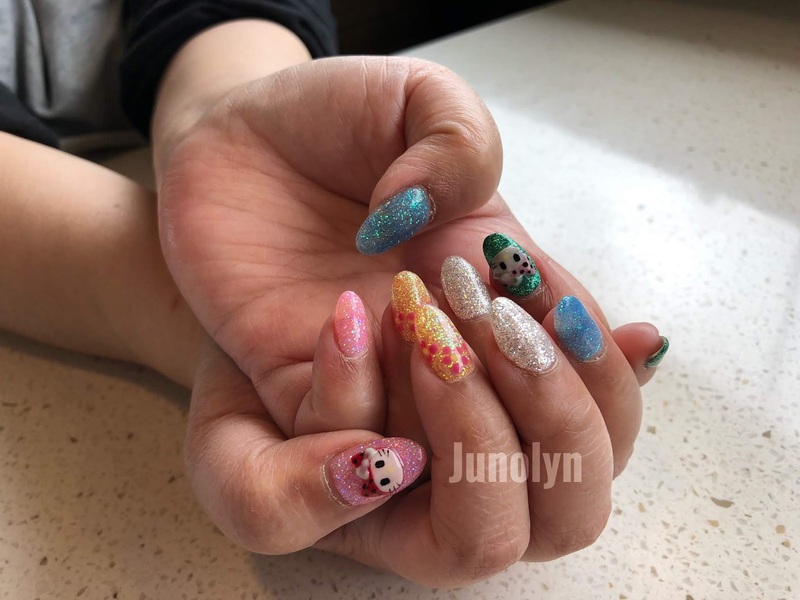 At least now that I can cross off Easter nails on my bucket list for Hello Kitty. Eventually, I'll make my way to other Sanrio characters for Easter. What do you think of this style? Do you like?